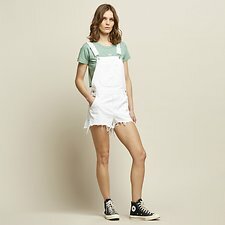 From Spring to Summer the Short Overall has you covered. This classic 5 pocket design features a large pocket on front, side hip pockets and adjustable straps with side button opening. Finished in a 100% cotton rigid white denim fabrication with a worn & destroyed look and shaped raw hem.